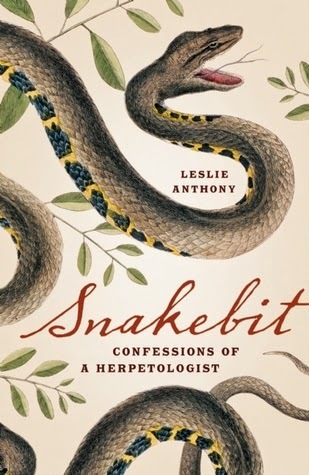 When I first heard about this book, I was somewhat suspicious — 'Confessions of a herpetologist' — who is Leslie Anthony? I searched my herpetological database and came up with nothing. When the book arrived, it was clear that he was a herpetologist —not just someone who likes amphibians and reptiles and decided to write a book about it. He has a Ph.D. in herpetology from the University of Toronto and was a postdoctoral fellow at McGill University's Redpath Museum. His acknowledgements include a number of well known herpetologists; still I couldn't find a single herpetological publication by him. Thus I started to read the book with dubious curiosity. By the time I finished the prologue, I was hooked. Anthony's writing style is engaging and his insights into the herpetological community and biology of amphibians and reptiles are genuine and accurate. Since he completed his postdoc, Anthony has worked as an outdoors/sports journalist. The origins of this book stemmed from a trip to Finland to write ski story for an international travel magazine. While working on the story he found himself in the Arctic circle watching snakes (Vipera berus) sunning in rock outcrops surrounded by snow and skiiers. While observing these snakes in such an unlikely location, and after having been out of mainstream herpetology for a number of years, Anthony was struck by how important amphibians and reptiles had been in his life and he suddenly wanted to know why — and why his life was so distant from these animals now. Thus began the journey that led to this book. A journey of remembrance, renewing old acquaintances, and reliving past adventures. Without going into too many details of the book, Anthony begins by recounting his childhood collecting amphibians and reptiles near Toronto. Eventually he landed a job on a faunal survey and became the herpetologist on the team. This work opened the door for him to meet James P. Bogert, who became his graduate advisor for his Masters. Anthony returned to Toronto for his Ph.D. under Robert W. Murphy, where among other things he played guitar in Rommy — the first and only phylogenetic rock opera (1988). He returned to play again in the tenth anniversary concert of Rommy II in 1998. During his postdoc at McGill's Redpath Museum Anthony worked with David M. Green. Throughout his herpetological career, Anthony went on several herpetological expedtions, most with Robert W. Murphy, to places such as Baja California, Vietnam, and Armenia. These trips as well as several others make up a large portion of the book. The exotic locations are made all the more exotic by the expedition members and the author's ability to tell a good story. But herpetological expeditions make up only a part of his journey to examine his past herpetological life. In 2006, Anthony returned to the joint ASIH/SSAR/HL meetings in New Orleans. His part retrospective, part insider commentary on herpetological meetings is insightful, although many herpetologists may disagree with some of his observations — and ichthyologists will wholehartedly disregard his observations as rubbish. "I owed a lot to herpetologists. Ultimately, they'd delivered me an understanding that no type of blind faith could ever serve up. Most importantly, I'd learned how to question and why. They had also given me laughter, absurdity, knowledge, deep time, discovery, healthy fear, and sheer terror. But if herpetologists... had taught me how to look at the world, then snakes had shown me how to see it. From within and never without. As part and not apart. Snakes led the way to a lifetime of natural appreciation. They'd also brought a sense of mystery, reverence, and true beauty. So I was indebted to them too..."
I think most herpetologists I know could easily agree with these sentiments. I also think most herpetologists would enjoy this book. It is very well written and engaging from the very beginning. Anthony pulls in tidbits from a wide variety of sources (Ditmars, Minton, and Francesco Redi to name a few). There is much in this book that herpetologists will be able to relate to. There are also several characters in this book that are well known in herpetological circles. If you have any inclination towards biographies or true life adventures, you will probably enjoy this book. My only criticism of the book is that there are no photographs — of people, places, or animals. After reading this book, I was armed with a bit more information about the author — where and what he studied — so I did another quick search to discover why I didn't have any references to any of his many publications. I quickly discovered that I had been led astray by the book. The author of the book is Leslie Anthony, however as a herpetologist he is known as Leslie A. Lowcock. Search for him using this name and you'll find a number of publications. If, like me, you have reservations about reading a book subtitled 'Confessions of a herpetologist' because you can't link the author to any herpetological research, you can cast those doubts aside. The author was (is) an able herpetologist.